The 42nd anniversary of the Lone Pine Time Trials is dedicated to the remembrance of Renee and Craig Angel. Their love, support and contributions to this event and to their entire motorsport family will always be remembered. Speed safely, Renee. You will be missed! Late entries will be accepted at registration/TECH on Friday June 1st from 5:00PM-11:00PM in the Sierra Cafe' parking lot next to the Dow Villa Motel. Late entries will also be accepted from 6:30AM to approximately noon at the event site Saturday, June 2nd. If you plan to compete on Saturday you must complete your registration before the Start of the first Run/Work group. Payment by cash or check only, please. Pre-registration online will save you some bucks so enter early!! *Additional entry details are explained when you log on to register. Friday, June 1st from 5:00PM to 11:00PM. Located in the parking lot of the old Sierra Café right next to the Dow Villa Hotel/Motel in Lone Pine. A mandatory drivers meeting will be held each morning at approximately 8:35AM immediately followed by run/work group assignments and staffing of the course worker stations. If by chance we able to post the run/work assignments in advance, please come to the drivers meeting prepared as we will be taxiing you to the North and South course stations. This is often fairly time consuming so please do you best to hustle. Saturday/Sunday- First car out at 9:00AM sharp! RUN AND WORK GROUPS: **All participants are REQUIRED to perform their assigned work duty for the duration of one run group. **This Time Trial event is only possible with the help of everyone in attendance. All worker positions must be filled to ensure that the event is conducted in a safe and timely fashion. Please do not skip your work duty! Awards, entry fees, run results and eligibility to compete in next year’s event will directly reflect your decision… and not in a good way! If you are unable to work the course for any reason, please contact the Event Chairman in advance to ensure a suitable work duty. ELIGIBILITY: MUST BE at least 16 years of age and hold a valid driver’s license. No membership required. Due to the high speed nature of this even, it is recommended for experienced competitors. SAFETY: COMMON SENSE! MUST WEAR SEAT BELTS AND APPROVED HELMET (some loaner helmets available). Helmets must be SNELL 95 or newer. No DOT helmets. NO alcoholic beverages or other intoxicants may be used by drivers, crew or spectators before or during each day’s competition. After the course is closed, have a blast! Please observe a 5mph speed limit in the pit and grid areas. VEHICLE CLASSING: Solo, Club Racing, SCCA, IMSA, VINTAGE, NASA, Spec E30, RallyCar, Lemons, the family sled, whatever. We will find a class for you. 5 or more pre-registered drivers who want to run their own class may do so. OPEN EXHAUST is allowed if your class permits it. Basic car classification per the 2012 SCCA Solo rule book. Still not sure what class? Provide details on how your car is prepared and we will find a place for you. Unsafe vehicles will be turned away at TECH so please review the safety guidelines in the Solo rule book!!! 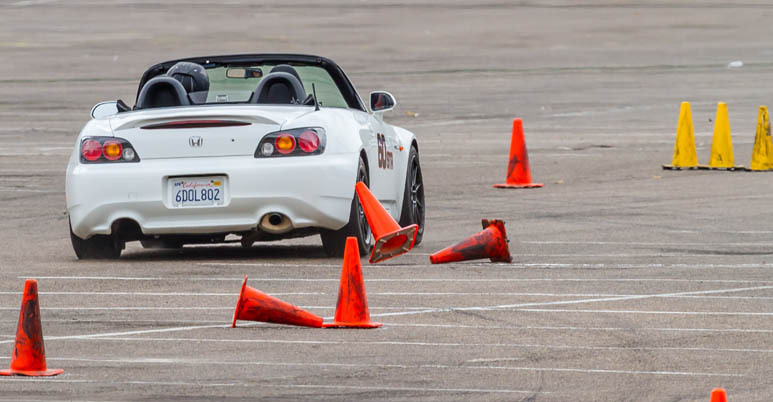 This is not an autocross event. It is a high speed time trial. Please go to http://www.lonepinetimetrials.com for more information and updates as they become available. You will also receive email updates through this online registration service. The Dow Villa Motel loacated in the center of downtown Lone Pine is hosting the event lodging. 20 rooms have been blocked so please make your reservations as soon as possible! Parking is limited to individual cars. There is no space for parking trailers directly in the Motel parking lot. However, there are several other hotels in town that have a bit more room. All rooms in Lone Pine are filling up quickly this time of year so get your reservations now. This high speed time trial is held on the abandoned Manzanar Airfield located in the Owens Valley, 10 miles north of Lone Pine. It was built in the early 40’s primarily for military training purposes. Roughly a decade had passed and the base was abandoned. Since then it has been used for a handful of military activities, TV commercials and special motorsport events such as this. The surface consists of the original asphalt and aggregate and prior to the annual “clean up” effort, can be partially overgrown with seasonal weeds as well as a particular contribution from both the indigenous and domesticated wildlife. This event has always had a surreal aura to it. The mysterious Airfield is bordered to the West by the snowcapped Sierras and Mt. Whitney. To the east, the far more arid Inyo Mountain range overshadows the foreboding Death Valley National Park. For a number of regular competitors, this is the only motorsport event they attend all year. For others, it is a unique opportunity to “stretch the legs” of their vehicle of choice in a picturesque yet raw event location. The course is fast and flowing with sparsely spaced pylon chicanes down both sides of the 5000’ runway and taxiway. Most vehicles will negotiate the majority of the 2+ mile course in third and fourth gear, only downshifting to 2nd to negotiate either of two slaloms and the start/finish area. The surface is fairly abrasive with heavy marbles off line, but there is quite a bit of traction to be found for those who drive a clean and tidy race line. The surface characteristics just add to the challenge and unique nature of this event. Last edited by YAWSPORT; 03-30-2012 at 10:53 AM. Just 3-weeks until Lone Pine! The Lone Pine Time Trials is coming up quick so please log on to the Myautoevents.com entry page and get registered. If you have any questions please don’t hesitate to email the event chairman in advance. You will find the contact info on the LPTT website and at the online entry page. Don’t miss out on this really fun event! Twenty rooms have been blocked at the Dow Villa Motel and these are filling up quickly. Be sure to mention that you are there for the Time Trials to get your room discount. You can also reserve rooms in the historic Dow Villa Hotel that is connected to the Motel. Friday night TECH/Registration will be right next door in the open parking lot right next door to what was the Sierra Café and most everything in town is within walking distance from the Dow Villa. As usual, we will have Room 32 reserved for the Friday night hospitality suite where you can meet and greet fellow competitors, enjoy free Pizza, Soda and of course the ever popular beer keg donated by Lee’s Chevron and Deli. Hope it goes well for you Brett. It's always the week after Memorial weekend. BOOK IT 2013! !